Tune in for a coding in education discussion on this week’s WELSTech. Jason Schmidt guest hosts with Martin and Sallie as we look at the trends detailed in the NMC K-12 Horizon Report 2016, and how the adoption of computational thinking across the curriculum might look in our WELS classrooms. Coding as a Literacy – Jason Schmidt makes his 2016-17 season debut on WELSTech, bringing his own brand of sunshine to the edtech discussion space. Today we look at the New Media Consortium K-12 Horizon Report 2016 and specifically the short-term trend of coding as a literacy. Coding education in schools – Crucial as English and Math … of is it? We celebrate the 499th anniversary of the Lutheran Reformation with this week’s music video, A Mighty Fortress is Our God by Koine, from the WELSTech Music YouTube playlist. Episode 469 – Staff Minister Dan Schoeffel joins the conversation to share information on Internet addictions. Release date: Wednesday, November 2. Welcome back to WELSTech. 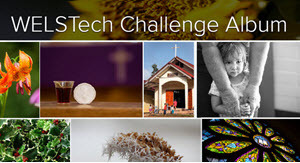 This week we share your community feedback covering technology plans, social network tips, and church year calendars. Throw in a 3D printed WELS Logo plus a large dose of doctrine joy, and there is something for everyone. Join the conversation! 3D printing meets ministry – Martin and Sallie open real and virtual mail bags to share listener’s helpful resources and ideas for using tech in public and personal ministry. Check out Martin’s Digital Christianship presentation, part of the Gospel Outreach with Media Fall 2016 online conference which runs through October 31. Essay files at Wisconsin Lutheran Seminary – Doctrine joy! The newest addition on the WELSTech “Likes” list on Vimeo, features our very own Martin Spriggs in a Together technology video update. Episode 468 – Jason Schmidt is back in the guest host chair, with a healthy dose of sunshine in tow, as we dive into the latest Horizon Report for K-12 educational technology. Release date: Wednesday, September 28. WELSTech is back with episode 466, a look at the social media platform Pinterest and how it can be used to spread the good news of Jesus Christ. It’s installment two of our year-long look at social media for ministry. We also bring you news of Christmas outreach resources, a free online conference, and an easy way to design verse images. Pinning away – The Social Media for Ministry series is back, and this month’s focus is the media rich bookmarking app Pinterest (Martin’s favorite). View the full-size Pinterest for Ministry infographic, and check out the links below for more details. This week we’ve added What’s Pinterest?, just one of the many helpful videos on the Pinterest YouTube channel, to the WELSTech Product Demo playlist. Episode 467 – It’s Community Feedback week! Tune in because there’s always something new and helpful to explore. Release date: Wednesday, October 19. WELSTech is back, and Martin and Sallie are talking about simple steps to guard against security breaches of personal information and avoid identity theft on all fronts. Google Apps has a new name, it’s Pastor Appreciation Month, and we’ve got lots of coffee! 12 of 66 – Martin and Sallie share a preview of Consumer Report’s 66 Ways to Protect Your Privacy Right Now. These simple, common-sense tips are worth review and could save you a lot of heartache! Enjoy the Christian Worship hymn Lord, You I Love With All My Heart (text) on the WELSTech Music Playlist. Episode 466 – Martin is in the spotlight as he schools us on using Pinterest for Ministry! Release date: Wednesday, October 12.